The case for a rise in US interest rates has been bolstered by strong jobs data for October. The economy created 161,000 posts last month and job creation for the months of August and September was revised up. The unemployment rate edged lower to 4.9%, according to the latest report from the US Department of Labor. The healthy labour market will support the view held by many analysts that the US Federal Reserve will raise interest rates next month. Average hourly earnings were up $0.10, or 0.4%, in October, a slight acceleration from September’s 0.3% increase. “A solid employment report for October further clears the path for a December Fed rate hike,” said Chris Williamson, chief business economist at IHS Markit. 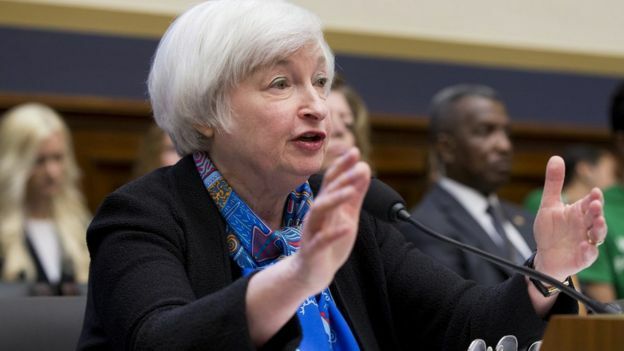 “It seems that the only remaining obstacle to the Fed hiking in December would be a significant adverse financial market reaction to the US presidential election,” he added. On Wednesday, policy makers at the US Federal Reserve decided to keep interest rates on hold, which means rates have not moved in almost a year. The Fed last raised rates, to a range between 0.25% to 0.5%, last December – its first move in almost a decade following the financial crisis. “The solid gain in employment and the acceleration in average hourly earnings growth in October will increase expectations that the Fed will hike interest rates in December (assuming that the election doesn’t throw a spanner in the works),” said Paul Ashworth, chief US economist at Capital Economics. The body which sets US interest rates, the Federal Open Market Committee, next meets on 13 December for two days. Those policy makers, led by Fed chair Janet Yellen, will have noted the strong performance of the US economy in the third quarter. Data released last month showed that the US economy grew at the fastest pace in two years in the three months to the end of September. The world’s largest economy grew at an annual rate of 2.9%, according to the Commerce Department. The monthly jobs report details which parts of the economy are hiring. Last month health care, professional and business services and the financial sector saw the strongest job creation. An extra 31,000 jobs were created in outpatient medical care and hospitals generated another 13,000 jobs. There was also strong employment in computer systems design, which accounted for 8,000 new hires. Previous articleWill India dash UK trade deal hopes?